When Windows Update returns errors upon running or simply won’t run, Windows Update Troubleshooter in Windows 10 will come in handy to automatically resolve Windows update related issues. 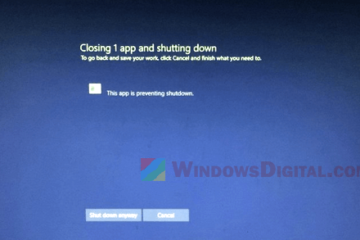 However, when even the Windows 10 Update Troubleshooter is not working to identify and fix your Windows Update issues, you may need other workarounds to solve the errors. 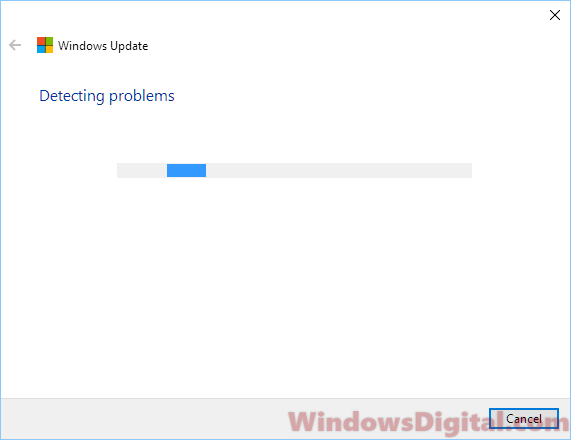 Windows Update Troubleshooter stuck at initializing the diagnostic is among the most common issues when the troubleshooter couldn’t find anything. Other common issues include Windows 10 update troubleshooter stuck on resolving problems, stuck on starting bits service or does not work at all. 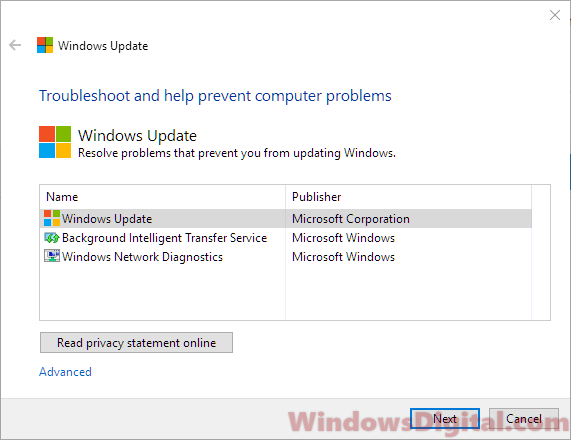 It may also appear as Windows update troubleshooter windows 10 service registration is missing or corrupt. Read the fixes below. When you troubleshoot returns a result, you can apply the fix suggested by it. However, there are some errors which the Windows Update troubleshooter is able to find out but unable to fix such as 0x803c0103 and 0x80244022 Windows Update errors. This can happen in Windows 10 Pro or Home edition, Windows 7, Windows 8, Windows server 2016, and server 2012. In that case, you may need to run some repair tools such as DISM and SFC. If the local Windows Update Troubleshooter in Windows 10 doesn’t work to resolve your Windows Update issue or if you can’t even start the troubleshooter, you may want to try to download the Windows 10 Update Troubleshooter from Microsoft.com and use it instead. 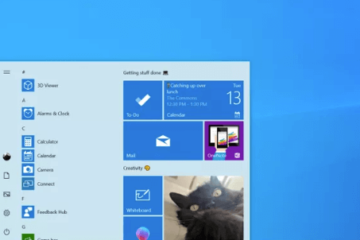 Download the Windows 10 Update Troubleshooter from here. 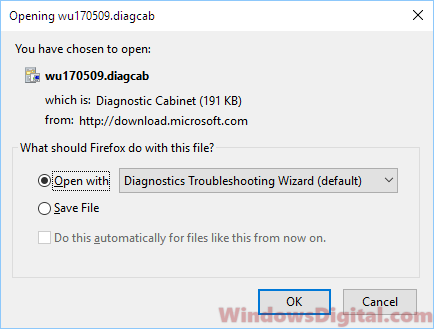 Open the downloaded wudiag file with Diagnostics Troubleshooting Wizard. By default, all .diagcab files will run on Diagnostics Troubleshooting Wizard. In the Windows Update Troubleshooting window, click on the Advanced link. Make sure the Apply repairs automatically is checked and enabled. Then, click on Run as administrator to allow the troubleshooter to run with admin privileges. In the troubleshooter, select Windows Update. Then, click Next. The Windows 10 Update troubleshooter should start detecting problems and will return possible solutions if an error is found. 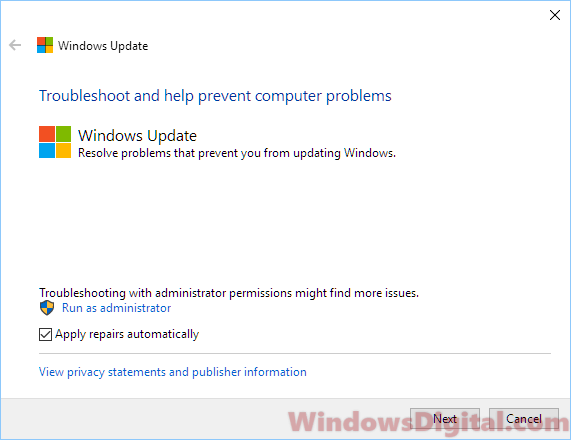 If both local and downloaded Windows 10 Update Troubleshooter does not work to fix your Windows Update issue, you can try to force install the latest servicing stack update. Then, try to run Windows Update again to see if it can check for updates this time. This is a common fix for when Windows Update couldn’t retrieve any update or always stuck at check for updates status. These issues could be due to corrupted updates in the past or missing system files which cause Windows Update to lose track of what updates should your PC install. By installing the latest servicing stack update, Windows Update will be able to recognize the version of the latest SSU so that it knows what updates your PC needs. To download the most recent servicing stack update, go to here. In the question at the bottom, select Windows 10 as answer. 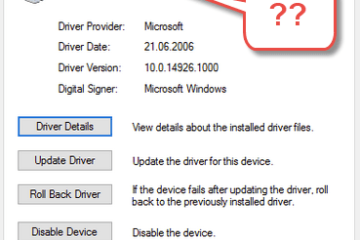 When asked if Windows Update troubleshooter resolve your issue, select No. 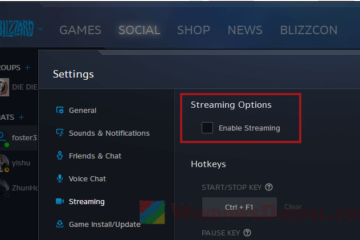 In the next question, it should suggest you to install the latest SSU which include a link to the latest SSU at the time you’re reading this guide. Click on Microsoft Update Catalog link to go to the download page. Select the update that matches your Windows operating system version, be it a 64 bit or a 32 bit system. 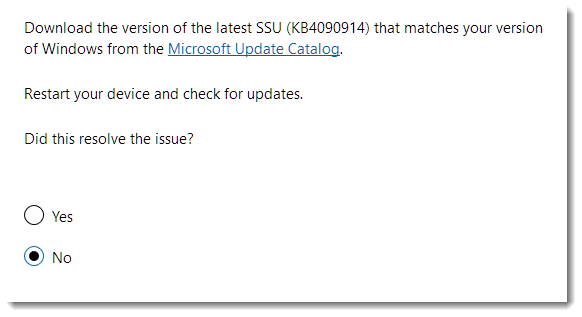 The reason we need to go to this page to get the link is because the Microsoft Update Catalog link on that page will continuously be updated with the latest SSU available. When you’ve installed the latest SSU, restart your computer and retry Windows Update again. 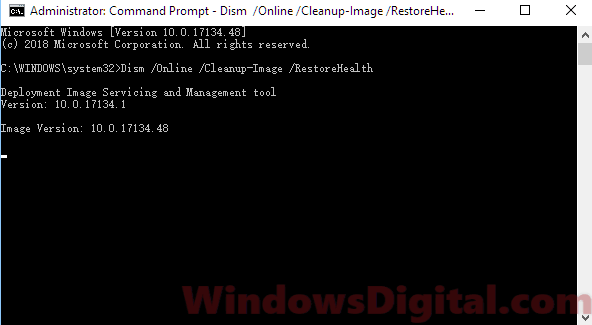 Deployment Imaging and Servicing Management (DISM) is a built-in Windows 10 repair tool which is able to automatically update files and correct servicing problems including Windows Update problems for your Windows 10 image. 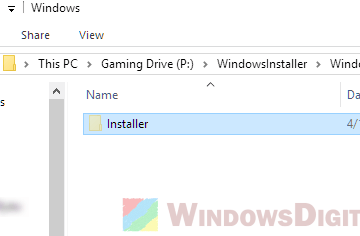 Running DISM will help resolve issues Windows 10 Update Troubleshooter couldn’t fix, such as the 0x803c0103 and 0x80244022 Windows Update errors. System file check, on the other hand, is a built-in repair tool to automatically scan for and repair corrupted and missing system files in your Windows 10 PC. To run these repair tools, go to start menu and type CMD. From the search result, right-click command prompt and select run as administrator. In the command prompt, enter the following commands followed by an Enter key after each line of command. The scans may take some time to complete. Enter the second command only after the first scanning is completed. When the repairs are completed, reboot your computer and try to run Windows Update again. Beside these repair tools, you may want to run a full virus and malware scan using your antivirus software or Windows Defender. Malware or virus could also be the cause of why your Windows Update couldn’t run or Windows Update troubleshooter not working in Windows 10. Run a full system scan to check for possible threats and remove them, then retry Windows Update again. If Windows Update Troubleshooter not working to fix your problem and you still couldn’t update your Windows, the last resolution would be to run update using the Windows 10 media creation tool. Go to here. In the Windows 10 download page, scroll down until you see create Windows 10 installation media. Click on the Download tool now button. Launch media creation tool. Select Upgrade This PC now. Select to keep personal files and apps so that the setup wouldn’t delete anything. Click on Install to begin installing the latest updates of Windows 10. Description for sharing: Read this fix if Windows Update Troubleshooter not working and fail to resolve your update issues - Download Window 10 Update Troubleshooter.